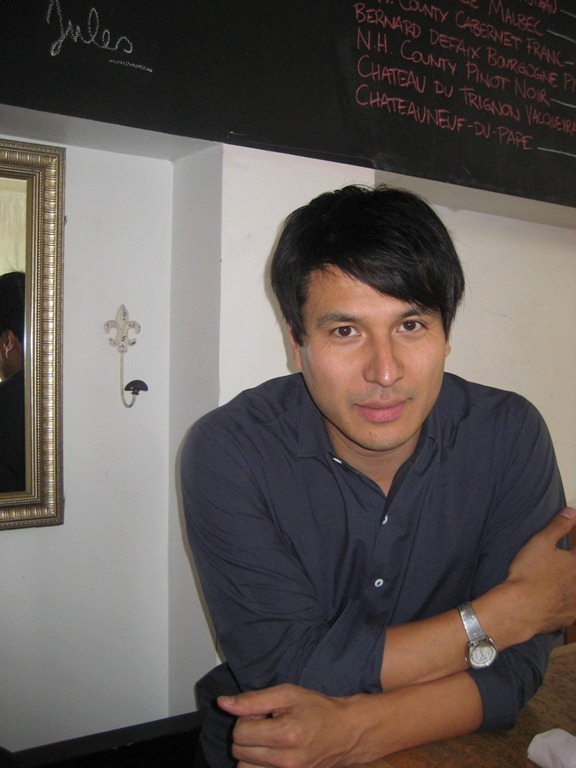 Jeffrey Remedios is the co-founder and president of Arts & Crafts, a record label and production company. Its first album that really helped to launch the label was 2003’s Broken Social Scene’s You Forgot it in People, still one of my favourite albums of all time. And beyond the record label, Jeffrey is involved with music in all sorts of ways. He sits on the board of CARAS (Canadian Academy of Recording Arts and Sciences), FACTOR (Foundation Assisting Canadian Talent on Recordings) and others. And one of his most exciting upcoming projects is co-chairing Operanation, a fundraising GALA on October 18th for the Canadian Opera Company’s Ensemble Studio that combines live performances by COC’s Ensemble Studio singers and contemporary music artists, such as past performers Broken Social Scene and Rufus Wainwright and this year’s just announced The Arkells and Nelly Furtado. We ate at Jules Bistro on Spadina just south of Queen. It’s a pretty bustling lunch spot but we met for lunch at 1 p.m. so it calmed down quickly. Both Jeffrey and I had the nicoise salad. It was a pretty tasty, light lunch. Jeffrey also ordered frites but they never arrived, strange. We both drank water and both had an Americano after our meal. Total bill was $44 with tax. Music has really defined Jeffrey’s life and he has been able to parlay that into an awesome career, starting working the public relations side at a major label and now with his own label. But the most interesting aspect of his love of music is how it’s constantly evolving. A great example of this is Jeffrey’s involvement with Operanation. He admitted that he didn’t know much about opera a few years ago but was invited to attend a previous Operanation. And then Alexander Neef attended a Broken Social Scene concert on the Island a few years back and they became friends. His interest and appreciation for opera grew from there, adding Broken Social Scene to Operanation the next year. I really appreciated how Jeffrey has so many great indie rock acts on his label but is still open and excited to learn about other aspects of music. Made me realize that as we get older, we can get a little stuck in what we like and maybe stop looking around to experience new things, it’s great to see Jeffrey continuing to want to learn and experience more. For anyone who is reading this and is totally jealous of Jeffrey’s job, he did offer some advice to anyone looking to start their own label. “Have Broken Social Scene be the first band you sign.” For the first three years of the label, they were able to work with Broken Social Scene, their friends and side projects of band members like Feist, Stars and Apostle of Hustle, who have all achieved great success including Feist winning the Polaris Music Prize just this week. Overall it was just a really great conversation that flowed from start to finish. Maybe it was the discovery at the end of our mutual love for Ira Glass’ This American Life where Jeffrey pointed out the most amazing app I have ever seen… every This American Life podcast ever recorded. No more saving up the new ones for road trips! We talked a lot about music, obviously. Jeffrey explained how music has really defined his whole life and even as he became interested in other things like politics, he still finds that music defines these other interests. I recently attended Jian Ghomeshi’s new book launch as the +1 of RAA’s lovely Amy Cole and I think this event was the perfect combination of so many aspects of Canada, music and culture and sort of played out in real time what Jeffrey was talking about. It was a literary event, The Arkells were the “house band,” Jian Ghomeshi joined them on-stage and sang lead, he talked about growing up in 1982 as an Iranian-Canadian and politicians were even in attendance like Olivia Chow and Justin Trudeau. A real combination of so much that is Canada. I asked Jeffrey if he attended as Broken Social Scene members also took the stage. Well he wasn’t there BUT he did help organize it. Of course he did. He really has his hands in a lot of stuff in this city. I was a little embarrassed when Jeffrey asked me what bands I listen to because I am 1. not the hippest and most up to date on my music and 2. I never remember bands’ names. But I was able to talk to those special songs that as soon as you hear them, you can totally be transported back to a moment in time. Like that first Broken Social Scene album that I listened to the whole way across Canada back on a crazy road trip in 2003 or Beastie Boys’ Ill Communication that transports me right back to the tenth grade. Hanging out with Jeffrey not only makes you excited about music but also about Toronto, there is so much going on all the time, so much music and so many interesting collaborations. I really need to take better advantage of everything this city has to offer and so should all of you!